A quick an easy side that is full of delicious parmesan garlic flavor with a hint of lemon. This is a side that you will make again and again! Asparagus is one of my favorite vegetables and I eat it almost daily! 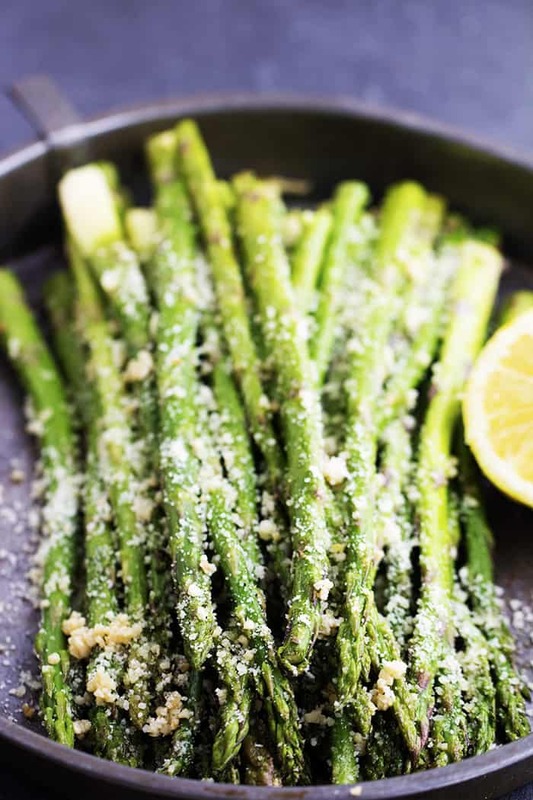 This recipe inspiration came from one of my very first recipes on the blog, this parmesan asparagus. I am always looking to find new flavor ideas when I cook my asparagus. Since I love lemon and garlic, I decided to add both! The combination of the three was absolutely incredible! Roasting asparagus couldn’t be easier. I love cooking it with our dinner because I throw it in the oven and it takes less than ten minutes to cook. If you are looking for a delicious side that is full of amazing flavor, you won’t regret making this one! Preheat oven to 400 degrees. 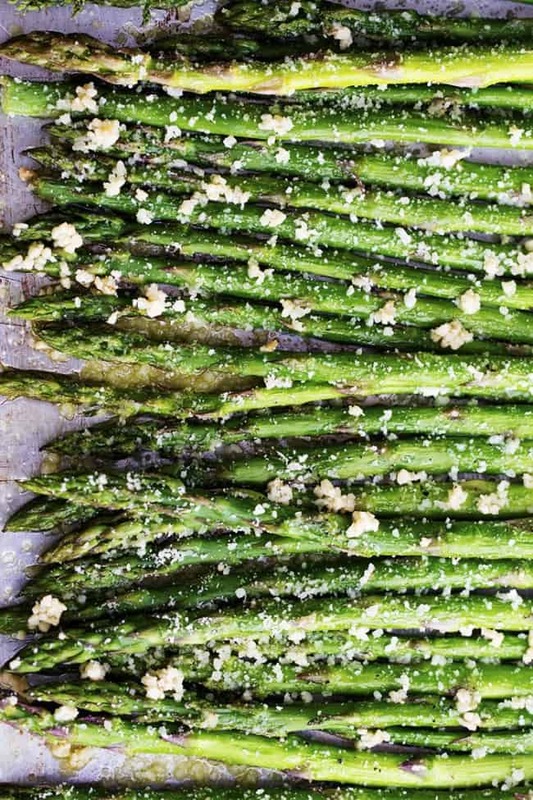 On a baking sheet, arrange the asparagus in a single layer. Toss in the olive oil and sprinkle with salt and pepper. Roast for 8-10 minutes or until the asparagus is crisp on the outside and tender in the center. Toss in the garlic, parmesan and lemon juice. Add more if desired. Serve immediately. I love many of your recipes! I am having trouble printing some of the recent ones though. Is there something different or that I should know about your print link??? Thank you so much! This was easy and delicious. Thanks! 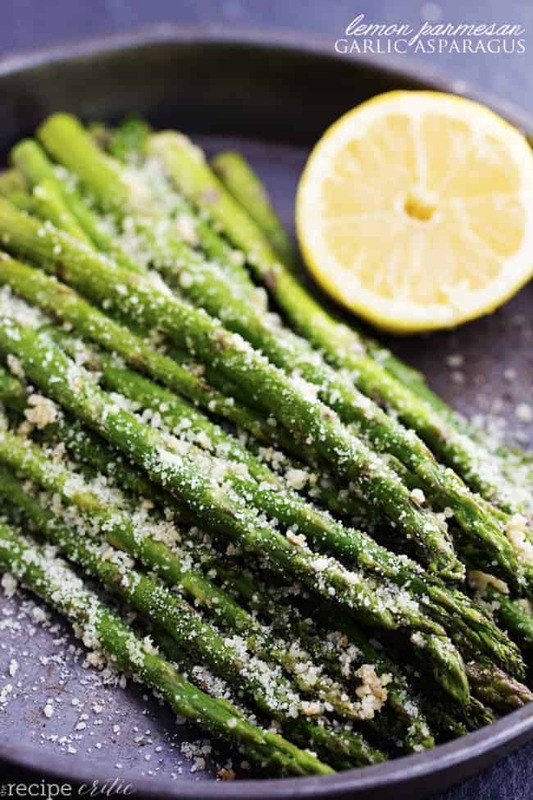 Do you put the parmo, lemon and garlic in after the asparagus is done cooking or in the last few minutes of cooking? My mouth is watering just reading about this combo! Love my asparagus like this! So simple and so tasty. We just had it again tonight. This recipe is so good!!! New to the site. I can’t wait to try this asparagus. Thank you for the recipe. I have made the roasted lemon parmesan green asparagus and it tasted nice. Next time though I will mix the olive oil with the garlic and then in the oven. When taking out pour some lemon juice and all the parmesan on top. seen the asparagus recipe on facebook, i printed it out, it looks good. I am in my 80’s,, would you believe I have never eaten asparagus in my life? Maybe if I try this, I will like it. Thanks. The Very best aspaargus ever! I could eat the entire pound by myself! The lemon is the best part!